Outbreak: Epidemics in a Connected World is an exhibition created by the Smithsonian’s National Museum of Natural History (NMNH) in Washington, D.C. This three-year exhibition marks the 100th anniversary of the devastating 1918 influenza pandemic. The exhibit, adapted for use by the Health Sciences and Human Services Library (HS/HSL), will be on display in the Library’s Frieda O. Weise Gallery, August 24, 2018 – October 14, 2018. The main message of the exhibit is “One Health,” which is derived from the understanding that human health, animal health, and environmental health are closely connected. Outbreak: Epidemics in a Connected World emphasizes the importance of interdisciplinary responses to stop outbreaks—and the impact those outbreaks have on communities. Outbreak examines zoonotic emerging infectious diseases (EIDs) and their pandemic risks in the 21st century. NMNH collaborated with public health institutions to address these questions: Why do pathogens emerge where they do? How do they “spill over” from animals to people? What causes them to amplify and spread quickly? And finally, what can individuals and communities do to prevent the next outbreak? The Outbreak exhibition project is a collaborative effort between the Smithsonian’s National Museum of Natural History and global partners to raise awareness of the human, animal, and environmental factors contributing to infectious disease epidemics. In conjunction with the Smithsonian’s Outbreak exhibit, the HS/HSL has created a supplementary exhibit remembering the 1918 Flu Pandemic. This year marks the 100th anniversary of the pandemic that killed between 50 and 100 million people worldwide. Baltimore and the University of Maryland, Baltimore were not immune to this incredible international natural disaster. This exhibit explains the spread of the disease in Baltimore and at the University, while supplying a supporting story to the Smithsonian’s “connected world” message. Thursday, September 13, 10:30 a.m. In conjunction with the Smithsonian’s Outbreak exhibit, the HS/HSL has created a supplementary exhibit remembering the 1918 Flu Pandemic. Please join us for our exhibit grand opening reception on September 13 at 10:30 am in the Weise Gallery on the first floor. Students, faculty and staff are encouraged to attend. Please RSVP HERE. Refreshments will be served. Thursday, October 4, 10:00 a.m. – 2:00 p.m.
Help protect yourselves, your families, friends, and colleagues! Flu shots available to UMB campus employees and students in the 1st Floor Tower of the Library (entrance to the left of the guards desk as you enter the Library). Flu clinic provided by Walgreens in collaboration with the School of Pharmacy and the HS/HSL. Please RSVP HERE and remember to bring your insurance information and ID. Friday, October 5, 11:45 a.m. – 1:00 p.m.
A light lunch will be served and Philip A. Mackowiak, ’70, emeritus professor of medicine and the Carolyn Frenkil and Selvin Passen History of Medicine Scholar-in-Residence will present, “The ‘Spanish Flu’ of 1918, What’s Past is Prologue” in the Gladhill Board Room on the 5th floor of the Library. 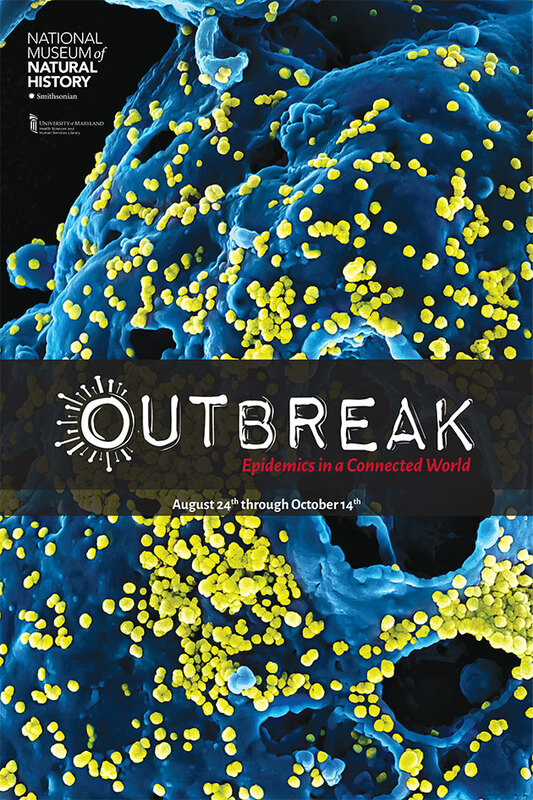 Outbreak: Epidemics in a Connected World emphasizes the importance of interdisciplinary responses to stop outbreaks—and the impact those outbreaks have on communities. Human, animal, and environmental health are intimately connected. Almost two-thirds of emerging diseases have a non-human animal source, and almost three-quarters of these originate from wildlife such as rodents, bats, birds, and primates. Human activities that disrupt ecosystems, such as illegal wildlife trade and hunting, deforestation, urbanization, pollution, and industrial food production, expose us and our domestic animals to pathogens carried by wildlife. Places that are frequently exposed could be where the next outbreak might occur, and international travel can spread it quickly anywhere in our connected world. Effective responses to outbreaks are multidisciplinary and often international. People and organizations from many disciplines and from all over the world work together to predict, prevent, and respond to EIDs. Doctors and other health workers, ecologists, biologists, veterinarians, epidemiologists, linguists, anthropologists, artists, economists, and technologists are just some of the people who work to raise awareness of One Health. Outbreaks have broad, and sometimes unexpected, societal consequences beyond the final death toll. Outbreaks can stress a community’s infrastructure to the breaking point, sever family connections, and change or lose cultural traditions. They can also ravage local and national economies. Adults and children who survive outbreaks or who lose loved ones often bear the burden of these consequences for years after and sometimes face stigma and prejudice within their own communities. Outbreaks also reveal shortcomings in public resources, highlighting the need for coordinated national and international efforts and better public education. We hope this exhibition will give visitors a better understanding of the ecological relationships of our rapidly-changing planet and inspire them to become informed planet-savvy citizens. With additional support by the American Society for Microbiology, Public Health Foundation, and World Organisation for Animal Health.